A couple of year's ago, I was one of those busy moms trying to do it all. I did the whole pick my daughter up from school to spare her the school bus ride given all the horror stories of mean kids. Two year's prior, my middle daughter was diagnosed with epilepsy so I knew the importance of not letting her go long without eating and of course, at school, their eating schedule is not based on the child's time. As I thought I was being a good mom, I would high tail it to the closest fast food restaurant after school to satisfy that immediate hunger. It wasn't too long later that I started noticing my little girl was turning a bit pudgy and knew it was time for some sensible snacking. My ideal snack is one of low calories that will satisfy that rumbly in the tumbly yet not fill them up so there is room for dinner. My girls never object to Jolly Time Popcorn for a quick snack, movie night or when traveling since hotels are equipped with microwave ovens. What is even nicer about Jolly Time Popcorn is the variety such as 100-calorie Healthy Pop varieties including one of my favorites, sweet and salty as well as my girls' favorites, rich Butter Flavor. Our complimentary sample boxes not only helped to squash those after school hunger pains but also went pretty well during our family fun night as you can see in the picture above of my middle child devouring a whole bag with her niece. Another favorite past time of my children, since we homeschool, is hands on cooking. I think every child should learn the basics in the kitchen. Jolly Time Popcorn even offers us some fun popcorn recipes. The Nutty Popcorn Fudge looks amazing. 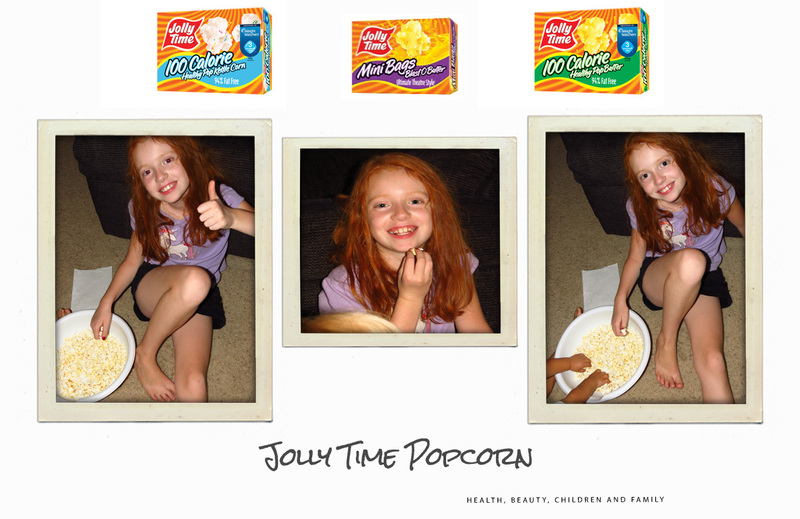 If you have been looking for that quick and easy after school snack, check out Jolly Time Popcorn and don't forget to like on Facebook and follow on Twitter to stay up to date.